A Simple Jew: Question & Answer With Akiva Of Mystical Paths - Spiritual Arrogance? Question & Answer With Akiva Of Mystical Paths - Spiritual Arrogance? There is a phenomenon within certain Chassidic groups only to learn the Chassidus of their rebbes. If you ask them about Sefer Baal Shem Tov, Toldos Yaakov Yosef, Me'or Einayim, or Degel Machaneh Ephraim they look at you with a blank stare or suggest you learn one of their seforim. While a person only has a limited amount of time to learn, and it is a given that he will learn the seforim of his Chassidus first, would you still consider it to be a form of spiritual arrogance to believe that a person can ignore these classic seforim that are the bedrock foundation for all Chassidic groups? First, I don't believe this 'phenomenon' is limited to 'certain Chassidic groups', but rather is a general phenomenon among what some call 'ultra-orthodox Jews', both Chassidic, Litvish, and Sephardic. I'll explain what I mean by this a little further along. Regarding Chassidim, we see that the students of holy gaon, student and leader of the chassidic movement after the Baal Shem Tov, HaRav Dovber, zt"l, the Maggid of Mezerich, fanned out to become the Rebbe's of various geographic areas. But stories from that time teach us that this was not a random affair, rather the holy Maggid targeted specific leaders to specific areas. 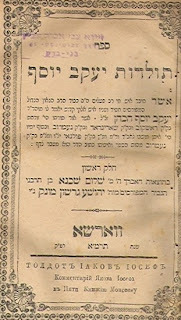 As different communities faced different needs, such as a depressed farming district that needing uplifting, versus a more town or city centric area that was dealing with nasty issues of Jewish society class stratification, different leaders, Rebbe's, with different approaches focused on the same goals, were appropriate. More emotional, or more intellectual, more learning, or more davening, more singing, or more meditative. As the chassidic communities grew and the generations past, the Rebbe's directed the spiritual welfare of their communities. More learning, or teaching, of a particular type. Adjustments to yeshiva curriculum's, deciding which minhagim would strengthen, and which would not. Historically, these communities where geographically separate. Indeed, one could easily understand the differences in the local environments, political and social conditions, education and work/commerce opportunities, leading to different approaches to which parts of Torah life to strengthen, and which not to. If one would travel from one community to another, itself a major journey of days to weeks to months, one could easily understand a community's directed learning and minhagim in the context of their local conditions. Ahh, but now we live side by side. A single family may contain members of different chassidic groups (indeed, we had a neighbor with 5 married daughters, one married a Lubavitcher, one a Breslover, one a Gur, one a Tzanzer, and one a 'generic' chossid), and a single neighborhood may have many living. Still, our Rebbe's of today (or spiritual leaders if not chassidic, or one of the chassiduses without a living Rebbe) try to focus the community path in relevance for their situation, whether it be part living in New York and part in Israel, or in tighter communities, or spread around the world. More insular or more worldly. So now to your question... "would you still consider it to be a form of spiritual arrogance to believe that a person can ignore these classic seforim that are the bedrock foundation for all Chassidic groups?" Given what I wrote above, though the goals are the same, the paths to get there are not. One who has a mature understanding of their path can learn from others, and/or take positive parts from many and synthesize a a wonderful multiple view. However, others can become confused at apparent conflicts between paths. And this is the majority. G-d forbid, this is not 'spiritual arrogance', this is following the tzaddikim of their generation who focus each path for the generation, the place, and the conditions of our time. And referring back to my opening comment, we see this among the Litvish and Sephardim as well, to study Zohar or not, to study Rambam or not, to study the Aruch HaShulach or the Mishneh Berurah or the Shulchan Aruch HaRav. I'll add two personal notes... In dealing with a recent personal problem, I consulted my friend and co-blogger, Rabbi Nati, who's a Breslover chossid, and a Chabad rav of mine. The action answer both gave was identical, but the spiritual reasoning was quite different, one focusing on emunah in Hashem and seeing the best in the situation and emunah that all will work out with the opportunities presented, the other focusing on the value of the mesiras nefesh in working on the opportunities presented, and that doing so will open spiritual channels to blessings being fulfilled. ...G'mara v'Chatima Tova, you and your family and all of Klal Yisroel should be sealed for a good and sweet year, one with the ultimate blessing of Moshiach Tzidkaynu, mamosh now! Please, Ribono Shel Olam, no more waiting, no more pain, no more tears, no more fear of this world! Pyasetcno Rebe sais, that one shouldn't say "this is beyond one's reach". Rather one should say - those who reached it also were human, and they worked to reach it. One should work to reach it. Wheither he will reach it or not - the Bashefer will decide. Regarding the sforim Breslovers have a view, that learning early chasidic sforim has a benifit in any case, and really there is no way to understand many aspects of Toyras Baal Shem Tov without them. In our time, when Moshiach is close by the light that is hidden is great. And the barrier is thinner. Like Reb Sholom Teumim ztz"l (the talmid of the Degel zy"o and Rebe Reb Boruchl zy"o) says, if before it was said "לא כל הרוצה ליטול את השם יבא ויטול" after the Baal Shem Tov it is "כל הרוצה ליטול את השם יבא ויטול"
People generally learn and value the sforim that they’re exposed to in whatever circle they belong to, and since there are SO MANY sforim in the world, it becomes somewhat impractical to sort through the seas of volumes. Perhaps we could apply the “law of 150” (http://www.usemod.com/cgi-bin/mb.pl?TheTippingPoint ) to this as well – i.e. that when there are a certain number of books, we stop studying the vast majority of them, and if there was a much smaller number we would be likely to study them all. Therefore, people generally stick to what’s most used in their circle. And in addition, there is the fact that various paths make absolute claims. For example, people who learn Rashash, are of the opinion that the derech of the Rashash is the only correct derech in kabbala – so why look at other sforim that deal with Penimius HaTorah? Similarly, in Chabad I have been told many times that Chabad Chassidus covers all that there is to cover in the world of Chassidus – therefore it is unnecessary to look elsewhere. And for another quick example, I have heard from some Litvishe Roshei Yeshiva, and I’ve heard others quoted, that the entire world of Chassidic Sforim is entirely unnecessary (and can be misunderstood) so it’s best to avoid them altogether. These attitudes also lead to people limiting their exposure to many sfarim. wonderful post. touchy topic so close to Yom Kippur. Chabakuk Elisha: With your analogy of the law of 150 in mind, there are not 150 "core" Chassidic seforim out there, so how could one justify not learning the core seforim that contain teachings directly heard from the Baal Shem Tov himself? Many concepts are presented, then later clarified and codified, presented in a more organized and teachable form.